The next SCC meeting is scheduled for Thursday, April 4, 2019 in the AC Room. Click on this link for a copy of the agenda. NHIS & NPAC received a generous donation from APEX - Legendary Features Productions US, LLC that will be used to continue to provide students the opportunity to participate in future NPAC productions. We are very grateful to APEX for their consideration and commitment to keeping the Arts alive in the schools. Alana Chong, a Junior at Nānākuli High & Intermediate School, has been selected to participate in a three-day summer retreat with the Islander Scholar Academy. The Islander Scholars Academy honors public high school juniors who exemplify the values that make Hawaiʻi unique. Alana will connect to and learn from other like-minded students, talk story with cultural practitioners and mentors, share about their communities and ‘ohana, and deepen their understanding of their kuleana as they head into their senior year and beyond. CONGRATULATIONS ALANA!! Click on the link to view the letter from Superintendent Kishimoto regarding the recent social media craze...The Momo Challenge. The "Momo Challenge" is an alleged form of cyberbullying that spreads through social media and cell phones. After phone users are enticed to contact a user named "Momo", they receive graphic threats from the user and are instructed to perform a series of dangerous tasks. Please have a serious conversation with your child(ren) about the this challenge and assure them they are safe. Click on the link to view a letter from Superintendent Kishimoto. Important message concerning the recent events over social media. The Department of Education takes these types of threats very seriously. Please talk with your child(ren) about the seriousness of this matter. NHIS will participate in the #HATNOTHATE Anti-Bullying Campaign. The #HATNOTHATE Campaign involves creating your own blue hat for Anti-Bullying and posting to social media with the #HATNOTHATE hashtag. This movement is to bring awareness and to stop Anti-bullying in our society. For more information on this movement click on the link..
HIDOE is introducing the Speak Now App to schools. It is a reporting tool to provide another mechanism for students to report incidents of bullying. Click on the link to view a video on how to use the App and other information. The mobile app will be available to download on Thursday, January 31. 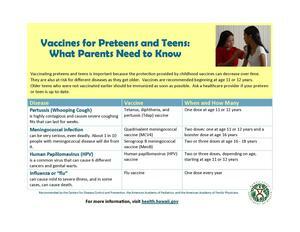 The Hawaii State Department of Education (HIDOE) is assisting the Department of Health (DOH) in promoting awareness of recommended vaccines to protect the health of adolescents.